Munk’s ninety minutes consist of field-recorded Buddhist chants and the ambient spaces where these practices occurred. 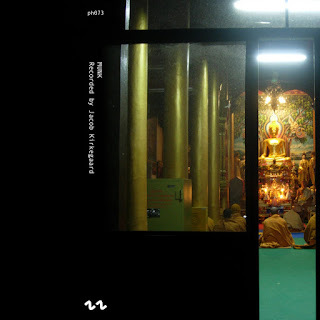 Sound artist Jacob Kierkegaard spent time in Thailand in 2007, and this cassette functions as an aural document of the people and culture he encountered. Kierkegaard loops these recordings, manipulating them as needed but allowing the natural beauty of the ritualistic mantras to stand almost solely on their own. The result is as mysterious as it is magical, a transportational device to locales on the other side of the planet. What we may not, with Western ears, hear on a regular basis is presented here to enlighten and educate those of us who are unaware of these rich cultural traditions. Is Jacob Kierkegaard the Alan Lomax of Southeast Asia? Find out for yourself.